Weekend breakfasts are a big part of our lives. Well any breakfast is to me. And K now needs her morning fix of Cappuccino too. Waking up on weekends is quite a struggle. So breakfasts are closer to noon if not to lunch time. I draw the line post one O'clock. There are the rare moments when I get up before eleven. Then I wait patiently instead of waking K up. Sometimes I nod off and she wakes up. You get the idea. The car cleaner and press-wallah have been told not to come before noon on weekends. And Banu herself appears after one.' o clock If at all. Weekend breakfasts are literally stretched out affairs with our coffees and sandwiches. It's been ages since we had breakfast at home. The idea is to laze and let the week seep out of our systems. We tend to go to one of the lovely places in an around Bandra and vegetate there.This weekend was a good one. Candies on Sat with Michael Jackson waking up the neighbours. Coffee Bean and Tea Leaf on Sunday. 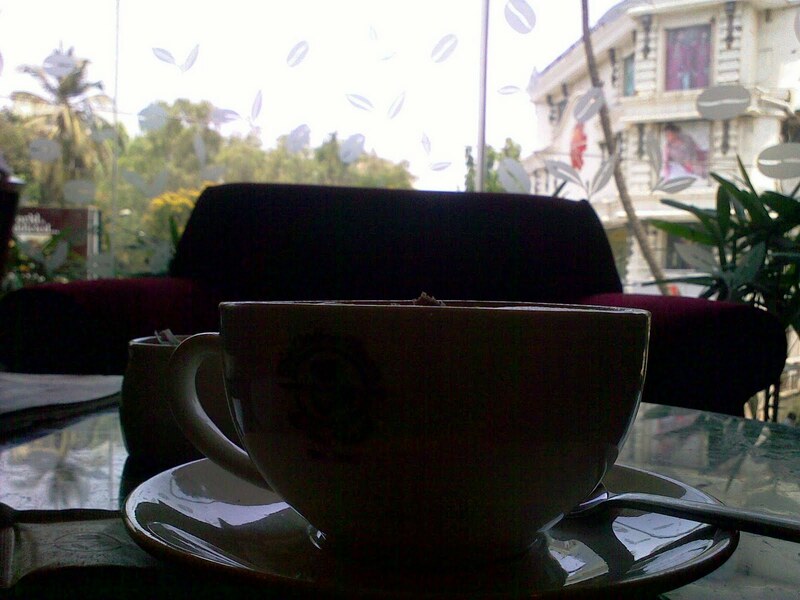 CBTL has one of the best coffees around. 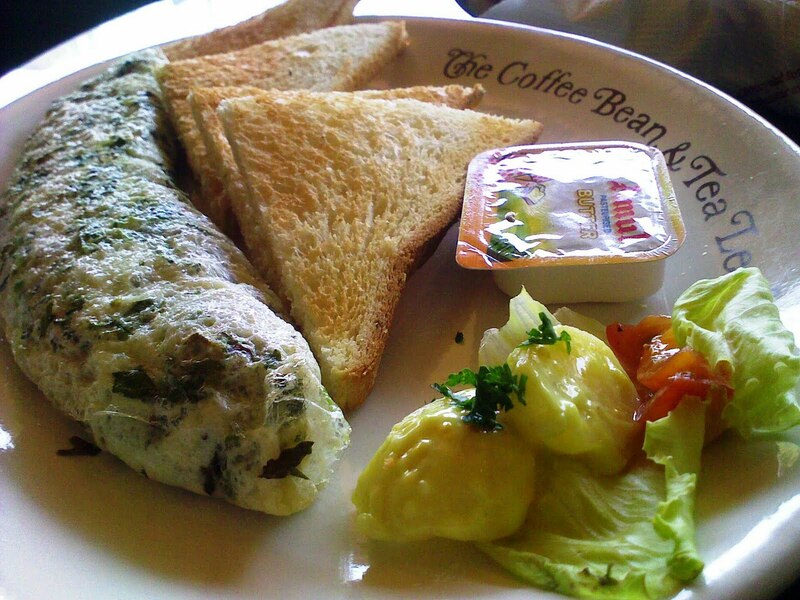 More importantly they are one of the few places which get omelettes right. We got an unusually competent waiter today. Sensing my reluctance to share K ordered her own masala omelette. I had an egg white herb omelette. Both pretty good. And nothing like sinking deep into their sofas and gazing aimlessly on a relatively lazy Lining Road. I took my new laptop out for the first time. Thought I will write there. They have free Wifi at CBTL. The thought of million doorbells and a billion questions from Banu disturbing me as I tried to write in my study at home made me take refuge at CBTL. So I left the comfort of the sink into heaven sofas and went to one of the hard backed chairs once K left. Got the Wifi password and connected. But Mozilla didn't open. Nor did Explorer. Must have been a problem with the comp settings. Tried switching it off, lowering security settings, trouble shooting... nothing worked. Others had connected their laptops to Wifi. So it wasn't a problem with the Wifi. Anyway I had a new magazine assignment to work on. Finally managed to open Word and pounded away. Fuelled by an Ultimate Mocha. In hindsight it was good that I couldn't got connected. Finished the first draft without being distracted. Hope it works out well. I am one of those mid thirty folks who thrive on the world wide web without knowing too much about the mechanisms invovled. A bit like Bertie Wooster who could drive a car but was foxed whenever Jeeves would pull out a spark plug or two. So any suggestions would be welcome. I have a Vaio. It connects to the Wireless Broadband at home. As well as to the Tata Indicom Photon. It connected to the public Wifi. But i couldn't open the net. Any idea on what I need to do to open the internet if I connect to an external Wifi? Help sorely sought. By the way went back to the gym for the first time after I joined it. Ran out of excuses. So headed there after a coffee shake and half a chicken croissant at Gloria Jean's. K Suggested ordering ice cream after dinner. So guess there won't be any evidence left of the sweat that I spilled on the treadmill. At the cost of sounding cheeky...did you switch on the bluetooth of ur lappy? @Mentalie: I've found a reason to bunk today. Last KKR match. @Sharmila: The stony slilence was not intentional. My knowledge about anything technical is a big fat round 0.So you are not alone.. Come to think of it.. am scared of anything technical.. I still rememeber having read voraciously for 3-4 days non stop to write a proposal on something technical..
Hmm...could you open IE or Firefox before connecting to the internet? I am tempted to say that it is a crazy Sony thing (because I hate my vaio...soon to be ditched), but that is just being unfair. I would try opening FF or even Outlook with the wireless off and then try to connect and see what happens. Sorry, not very helpful is it?! Lazy brunch sounds like a very nice way to spend the weekend. Impressive effort to go to the gym after the cafe...if I don't go first thing in the morning, I don't go at all! @Spice and More: I don't think I tried that. Will. It connects to the wireless at home and to my web data card though. When you say, you cannot connect to the net, or that mozilla won't open, what do you mean? What is the message in the browser? Does it say connection refused? or does it keep spinning and waiting ... before finally timing out? Which firewall software do you have on your laptop? Who configured it? Or are you using it as it came with the laptop? Your photos speak for themselves- one look is enough to make the mouth water ! 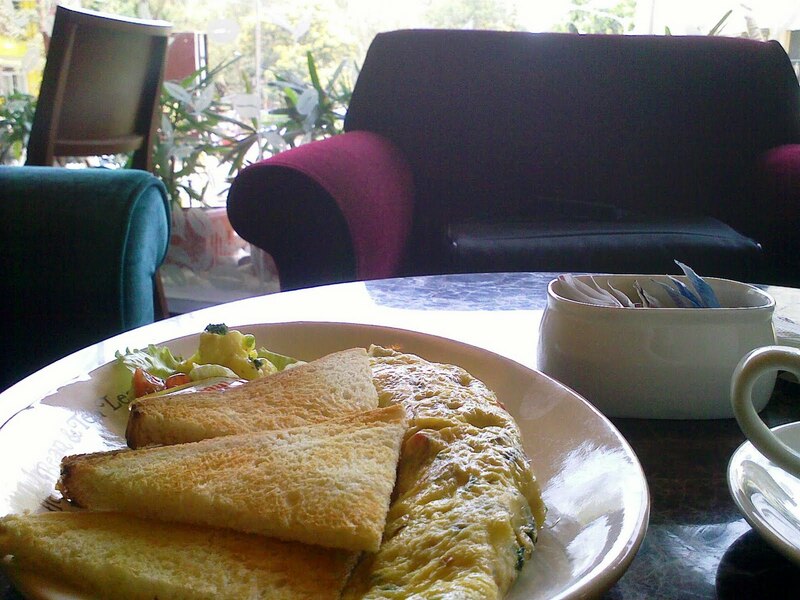 Nothing like a leisurely had lazy Sunday breakfast !